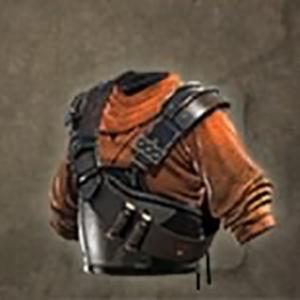 Togakushi Shinobi Apparel: Joi is a Torso Armor in Nioh. "Upper-body wear dyed a deep khaki and reinforced with an iron breastplate. The colour was specifically chosen to provide ample camouflage in fields and mountains, as well as urban areas. This apparel was worn by the Togakushi ninja, whose base was located at Mount Tokagushi in northern Shinano province (present-day Nagano prefecture). Sarutobi Sasuke, who travelled the lands in order to master the ninja arts, trained rigorously on the precipitous crags of Togakushi in order to hone his skills"